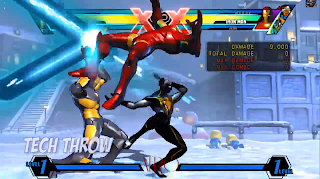 Xero18 is back with a proof of concept glitch for Ultimate Marvel vs. Capcom 3. Find out how to get an untechable throw inside. Using Spider-Man, Xero18 has posted a UWT proof of concept glitch. With the help of Iron Man's Repulsor Blast and Dante's Jam Session, Spidey is able to perform an untechable throw.